Ronald Brautigam has deservedly earned a reputation as one of Holland’s most respected musicians, remarkable not only for his virtuosity and musicality but also for the eclectic nature of his musical interests. He has received numerous awards including the Nederlandse Muziekprijs, the highest Dutch musical award. A student of the legendary Rudolf Serkin, Ronald Brautigam performs regularly with leading orchestras including the Royal Concertgebouw Orchestra, BBC Philharmonic Orchestra, City of Birmingham Symphony Orchestra, Hong Kong Philharmonic Orchestra, Orchestre National de France and Gewandhausorchester Leipzig. Among the distinguished conductors that he has performed alongside are Riccardo Chailly, Charles Dutoit, Bernard Haitink, Marek Janowski, Sir Roger Norrington, Marin Alsop, Sir Simon Rattle and Iván Fischer. 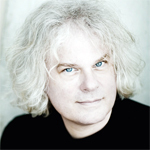 Besides his performances on modern instruments Ronald Brautigam has established himself as a leading exponent of the fortepiano, working with orchestras such as the Orchestra of the Age of Enlightenment, Tafelmusik, the Freiburg Baroque Orchestra, the Wiener Akademie, Concerto Copenhagen and l’Orchestre des Champs-Elysées. In 1995 Ronald Brautigam began what has proved a highly successful association with the Swedish label BIS. His discography of over 60 recordings to date includes the complete works for solo keyboard of Beethoven, Mozart and Haydn on the fortepiano, as well as an 11-disc series of Mozart’s complete piano concertos on the fortepiano with the Kölner Akademie, playing on period instruments. Among his most recent releases are two discs with Mendelssohn’s complete Lieder ohne Worte. His recordings have received prestigious awards such as the Edison Klassiek Award, Diapason d’Or de l’année, MIDEM Classical Award and the Jahrespreis der Deutschen Schallplattenkritik. Ronald Brautigam is a professor at the Hochschule für Musik in Basel. For further information please visit Ronald Brautigam's website.